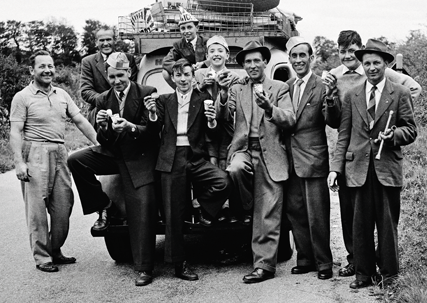 This image is featured in our Kerry Lives exhibition, a portrait of life in Kerry from 1950 to 1973, illustrated from the Kennelly Archive. The Kennelly Archive is a remarkable collection of photographs taken by husband and wife team Padraig and Joan Kennelly, professional photographers from Tralee, Co. Kerry. This is a fascinating pictorial record of the transformation of a rural society into a modern urban one. People didn’t have their pictures taken that often back then, and so the appearance of this young couple with a camera offering to take a snap of them going about their daily business was a novelty. All of life is here, from the formal events that mark big days like weddings and christenings to news stories, sporting occasions, festivals, famous visitors to Kerry, right down to casual, everyday scenes.